I was at the R-Community Fair when I noticed you. You were in a wheelchair again—a history of chronic pain occasionally warrants a wheelchair. I couldn’t help but ask, “So how about that construction?” You told me your struggles with wheelchair accessibility across the Rollins campus. The eyesore of the Mills Building’s innards cannot be missed and it has altered the major traffic patterns that once surrounded it. Now, the rubble blocks the only ramp into the Campus Center. To eat, you must wheel down a steep pathway leading to the back of the building, weave through the heavily trafficked Dave’s Boathouse, and then (because you have no choice) ride up the old service elevator, which has an expired certificate of operation posted. The whole ordeal takes you an extra 10 minutes. As a busy college student, I thought about how sometimes I only have 10 minutes to eat. For you, to eat three meals a day, seven days a week, now takes an extra hour of travel time every day or 105 hours a semester. 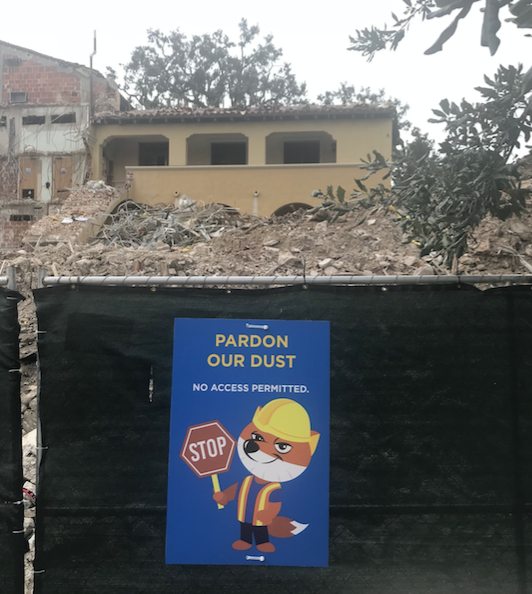 Rollins is paying for all this aesthetic construction, rather than putting your money toward a more accessible campus. The college has failed to update its preexisting accessibility concerns, and instead it has built more barriers for you. Your residential hall has no button to automatically open the main door. It’s already difficult to open a door from a wheelchair, but with your chronic pain, it’s physically dangerous just getting to and from your room. You feel less safe. You take the elevator. It gets stuck. Its posted certificate of operation expired Aug. 1 of 2017. You’re late again. These barriers aren’t new. Remember your first year at Rollins? You were excited about your class schedule, where one class is located on the second floor of Orlando Hall. However, you could not access this class, because the building does not have an elevator. You changed class locations. Even before then—you wished you could be as enthusiastic about SPARC Day as your peer mentors, but your class was assigned a location that was not accessible by wheelchair. The Center for Leadership & Community Engagement said it was mandatory, and you feel as though you are jumping through hoops just to do a charitable act for the community. You felt so alone. You contemplated dropping out. It never really ends. Now, it is the middle of the night. You need to use the private restroom in your residential hall because the public bathrooms are not accessible. It’s locked. You knock on your RA’s door. You can tell you just woke them up, and you’re apologetic. High school was really hard. You truly hoped college would be easier. Surely Rollins would be better. Instead, you are unhappy here; everything feels like an obstacle. I think of my favorite spots on campus and how many of them cannot be accessed in a wheelchair. I cannot study with you in the tower of Olin library. We cannot joke around and relax in the pillow room. We cannot be gym buddies, because the Alfond Sports Center does not have the equipment you need. Forget about scenic strolls around the lake. The places where I made many of my college memories are places you will possibly never get to experience. So, I want you to know that I will hold the door for you so you can come out on the balcony of Ward; I will carry your groceries home from the C-store; I will do my best to be there when you are feeling isolated; and I will raise my voice on your behalf. I heard you. I hear you. And I am fired up, to say the least. I want you to know this is unacceptable and that we are going to do something about it. That is why I typed my first real Facebook post in years—and it blew up. I heard from Rollins students with disabilities who face the brunt of this discrimination; I heard from concerned alumni who want to help manifest change; I heard from concerned parents; I heard from faculty and staff at Rollins; I heard from family and friends who showered me with pride and gratitude. As an able-bodied person, it is easy for me to see the daily hardships thrust upon my disabled peers. It was easy to stand up and say something. It is not noble. It is a matter of basic human rights. It is a matter of equality—and be assured, this is an ongoing issue, not a temporary one. 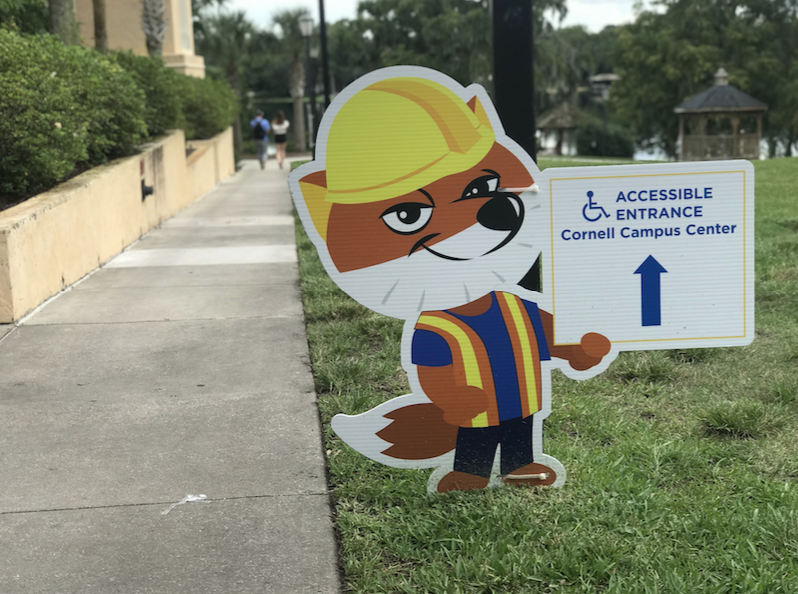 The various construction projects on our campus have brought to light a much larger issue of accessibility at Rollins, so I started the Rollins Inaccessibility Selfie Project. It is a Facebook accessibility tour of our college and it is important that able-bodied people, like me, notice these things and how they impact others. However, noticing is only the first step. Let Rollins know how you feel; be the squeaky wheel. The voices of people with disabilities will no longer go unheard.